A feline on a mission, prepared to destroy everything in sight with its mighty merciless paw. A game from the perspective of a cat, just doing cat-like things and wrecking everything in sight like the spawn of Satan you are. That’s pawsitively purrfect. That song from the Aristocats was on to something. “Everybody – Everybody – Everybody wants to be a cat!” Think about it. Who wouldn’t want to be a cat? 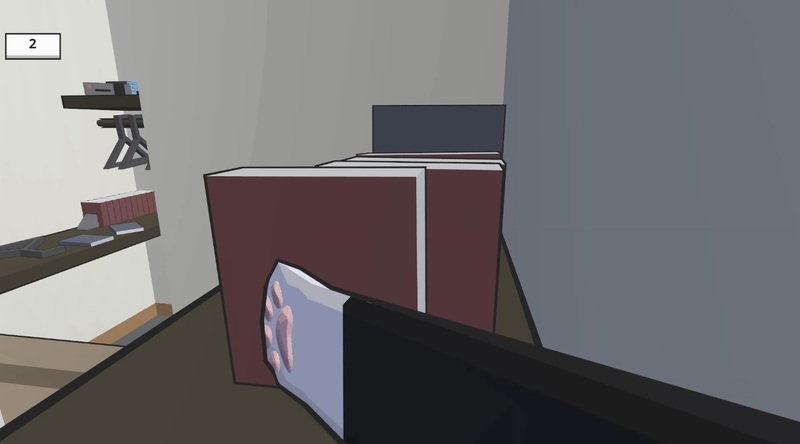 Just about every object in the room can be hit and moved around. A big, fluffy, lazy, and adorable creature without any obligations in the world. Your biggest concern is finding a that mysterious, seductive, red dot; previously located on the cabinet next to you – OH WAIT, NOW IT’S ON THE WALL – and finding the most comfortable keyboard to lay on. Hard at work, just lazing about and sleeping all day. Someone else preparing meals and water for you without any effort needed, except a pleasant chirp or meow. You don’t need to worry about plumbing; you have a box of sand for your potty needs. Lastly, numerous objects all over the house to sharpen your itty-bitty nails on. The more, the merrier. Before you know it, the entire room is littered with objects. If there are cups, plates, or any burdensome silverware blocking your pathway, well, you need to show that cup of soda who’s boss, don’t you? Who cares about messes, the human will clean it up! It’s a life of luxury. I know you’re thinking it; you want to be a cat. Purrsonally, I’d love to be a cat. And we all can become feline friends in the world of Catlateral Damage, created by Chris Chung. 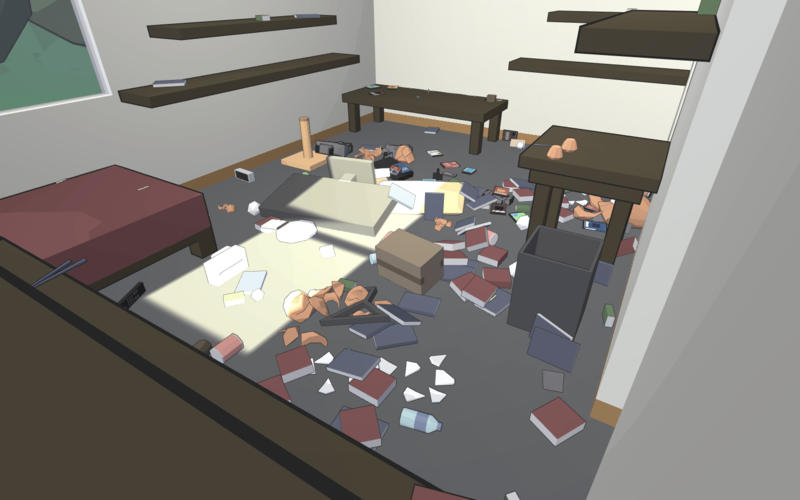 Catlateral Damage was originally a demo released around January, inspired by Chung’s own cat, Nippy, which picked up quite a bit of attention from indie game enthusiasts. It was even Greenlit on Steam within 8 days, the community is that strong. That’s a nice room you’ve got there. It’d be a shame if something were to happen to it. 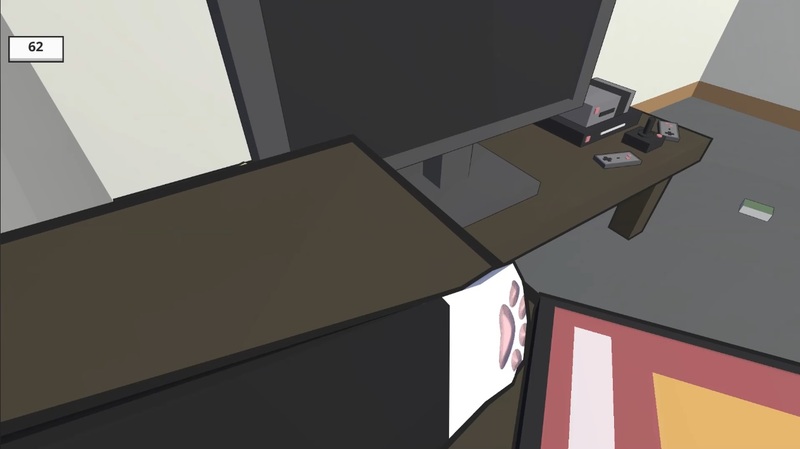 In Catlateral Damage, you are in first person as a kitty with a thirst for destruction. You’re alone in a room filled with miscellaneous fragile and attractively mobile objects that are just begging to be relocated – and maybe smashed into thousands of pieces. You’re a cat on a rampage, knocking down everything in sight and showing your owner who’s really in charge. Players are given a specific time limit to wreak havoc with their tiny, furry paws of destruction. Equipped with only two paws, it’s up to you to define what mischief truly is. The results will be catastrophic. But destroying expensive televisions aren’t your only kitty options: chasing lasers, hunting mice, hiding under couches, and standing in the middle of the doorway indecisively because you like the view from both rooms (and you don’t know where to go) are all fun possibilities in the world of Catlateral Damage. Such as ruining everything in sight because I dislike your set up. I’m not just a cat, I’m your new interior decorator. You’re a serial destroyer of merchandise, bouncing from house to house, knocking over everything in sight. 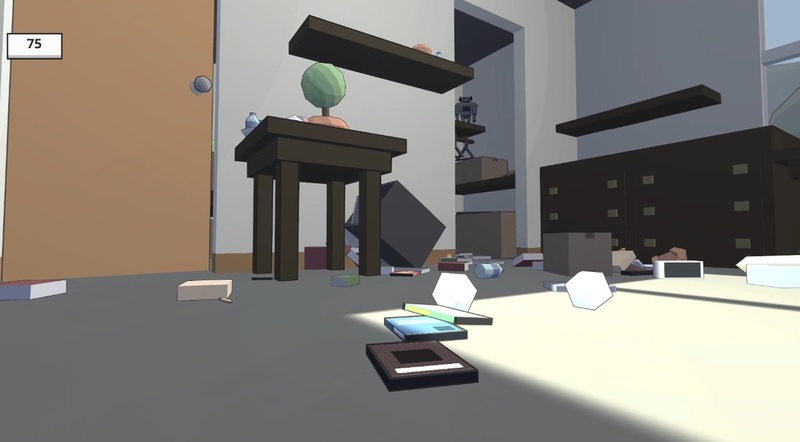 Each playthrough is always different, each time with a different arrangement of rooms, objects, and hidden toys to collect (we were wondering where that mouse toy went!). In each level, there are multiple kitty options to choose from, each having special abilities and skills separating one another. In the end, it’s all about the kitty mayhem. It all sounds like purrfect fun in Catlateral Damage and everybody’s looking forward to being a mischievous cat. 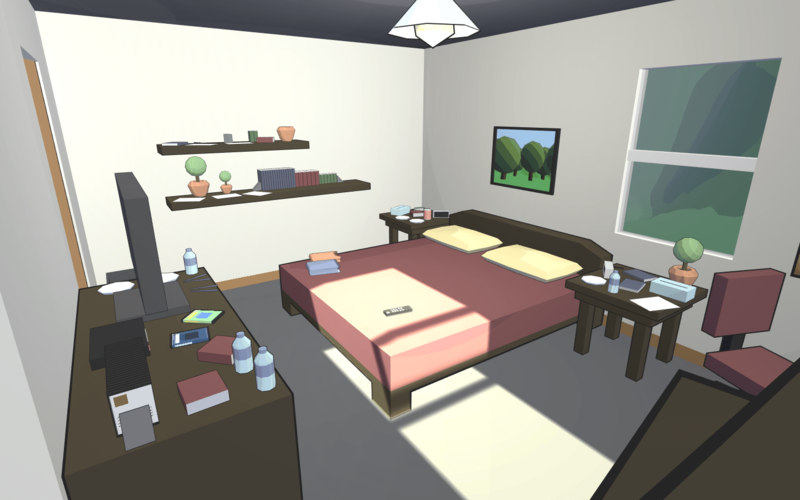 The Catlateral Damage Kickstarter campaign runs until July 11th and has a funding goal of $40,000.